If you are looking for a beach front property then look no further! This beautiful freshly remodeled 4 bedroom home sits directly on the beach - out the back door and into the water. Wonderful rear deck with soft seating overlooks the private sandy beach and Long Island sound. The cottage has been completely re-done inside and out. Everything is new! Free internet Wi Fi, Cable TV, AC. Completely furnished. All you need to bring is linens. It doesn't get any better than this!!! Bring your Jet Ski, Boat and use our mornings! 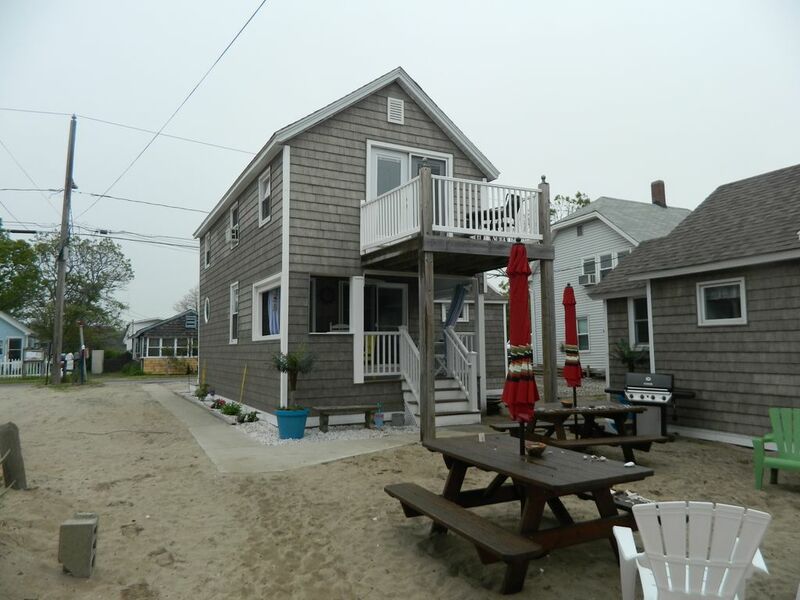 Take a look at our 2 BR beach front cottage in Clinton, CT Property # 202814. A very comfortable home just steps from the ocean. We had such a great time staying in this lovely beach cottage. It was clean and very inviting with all the basic necessities. The decks and a balcony were relaxing... just what we needed. I can’t wait to book again next year. Wonderful location and comfortable cottage. Bathroom and outdoor showers need minor repairs. Great vacation spot for younger children. We had a fantastic stay at the cottage. The location is great, outdoors and inside very stylish and equipped with everything you can ask for. We are a family of four (two small girls) and we all would love to come back. I highly recommend the 'Sharlene' cottage (as well as the other properties offered by New England Cottages). The Sharlene cottage and the next door 'Viola' and 'Kaitlyn' cottages are very tastefully decorated and comfortable for a couple or family. They are truly what you imagine a beach cottage to be (charm of yester year), but with modern amenities and decor. The owners/hosts were very gracious. The location right on the beach is amazing. Loved waking up to the ocean view from the bedroom balcony. Kids loved the Hobbie Cat sailboat and swim platform. Front and back porches were fantastic for relaxing. Property had everything you would need including a stainless gas grill. Very convenient to local grocery stores, restaurants, Clinton Outlets, etc. Enjoyed a cappuccino and scone at the M. Sarba cafe and art gallery. Would love to come back to this property or other New England Cottages properties in the near future! So glad we found this cottage for a much needed family getaway. Although we were not far from home, it felt like we were truly 'away' on vacation. The home was in the right location and at the right time. The community is very quiet, especially off season. The rooms are lovely. Despite my comments below, I would rent this house again. Upon check in the bathroom was dirty. I knew about the self cleaning, but the standard of "clean" varies among people. In this case, my "clean" was very different than that of the last occupant. Hair in the shower, urine on the toilet, hair and tooth paste in the sink, etc. Recommendation is to sanitize the bathroom yourself upon check-in since you can't count on the previous occupant to do so. I do think that a linen service at a "reasonable" charge would be nice. Especially if you are flying across the country. I am very sorry to hear of the condition of the cottage upon your arrival. You are sooooo right...everybody has a different definition of clean. This coming season 2010 we have our own cleaning staff going over every rental property we have after each renter leaves to make certain that they leave the property clean. As for the linen's we do offer a linen package for each property, sorry you were not aware of that. We hope to see you again in the near future so you can see for yourself that we have corrected these propblems. My family & I love the cottage & beach.It is a home away from home for us.There is everything there & more.They did a beautiful job with the decor.We really enjoy the private beach with the many extra's,like the floating dock,the rafts & the beach chairs.We look forward to our vacation in Aug.This is one of the nicest cottage's I have seen,& I have looked.We would never stay any where else,I only wish I could stay longer.The owners did an awsome job with these cottages,and there nice people to rent from.I do recommend this cottage to my family,friends & my customers. I am glad you enjoy you time on the beach it is always a pleasure see you each year. We have some great new features we will be doing over the winter. You will be suprised when you come in Aug.